The FSA in England will focus on its core remit of food safety policy and enforcement. “It makes perfect sense to bring policy on food origin and associated labelling to Defra to sit with wider food policy. The Government has made very clear its commitment to clear and honest labelling - particularly origin labelling. The following policies in England will be brought into the Department of Health: leading on nutritional labelling and EU negotiations on this; health and nutrition claims, dietetic food and food supplements; calorie information in catering establishments; reformulation to reduce salt, saturated fat and sugar levels in food and reducing portion size (including in catering); nutrition surveys and nutrition research; scientific advice and secretariat to Scientific Advisory Committee on Nutrition (SACN). The following policies in England will be brought into the Department for Environment, Food and Rural Affairs: food labelling, where this does not relate to food safety or nutrition; food composition standards and labelling, where unrelated to food safety; and leading on EU negotiations for all non-safety aspects of food labelling, except for nutrition. The FSA will remain a non-ministerial department reporting to Parliament through DH ministers. All three departments are working together closely on this to ensure a smooth transition. 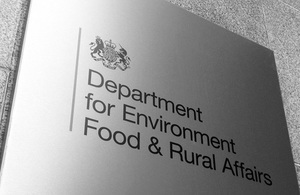 For Defra, the policy transfer will be immediate, with affected staff reporting to Defra ministers and joining the Food Policy Unit at Defra from today, though they will continue to work from the FSA offices for now. Physical moves for staff between offices will take a little longer, and the departments will work closely to coordinate these and limit disruption for staff. Exact timing for the transfer from FSA to the Department of Health, as well as the exact numbers of staff and posts transferred to both Departments will be available in due course. For media enquiries please contact the Department of Health news desk on 020 7210 5221.